Your mission, should you choose to accept it, is to create a card/tag using black, white and one other colour. I've always been a sucker for pink, especially since I see so little of it, having a house full of testosterone. I used a couple of different sets for my card - the stamped panels have been created using Zigs and Zags. For the base strip I clear embossed one of the more detailed borders and on the larger panel I stamped a background in two different shades of pink. The sentiment is from Dream Then Do, a perfect set for the chalkboard technique. To be in with a chance of winning, link your creations using black, white and one other colour. 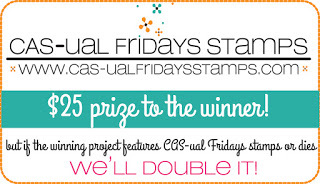 Use CAS-ual Fridays products as the focus of your project and Michele will double your prize to a $50.00 store credit voucher! Enjoy getting inky and thanks for stopping! This is so pretty!! I love that large saying with the black background. I think I am going to have to play this challenge this week! !